Month eight Tigress’s can jam canning challenge and for August the ingredient chosen by the inspired and inspiring Julia is tomatoes. My relationship with this ubiquitous fruit has been a checkered one. I hated tomatoes as a kid but learnt to tolerate them later on. I do like them as a sauce for pizza, applied with a lightness of touch though. I can now eat cherry tomatoes raw and, like biting into any fruit, appreciate their sweetness so I suppose you could say I’ve made progress. But it is as objects of beauty that tomatoes especially come into their own. 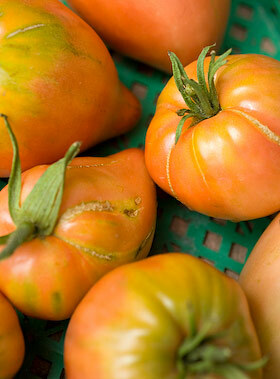 The resurgence of interest in growing heritage varieties has brought all these wonderfully coloured tomatoes to the fore; striped, heart and pear shaped, shaded like a shop display of lipsticks, from gold to chocolate. They are all so fantastically photogenic and worth growing for looks alone. 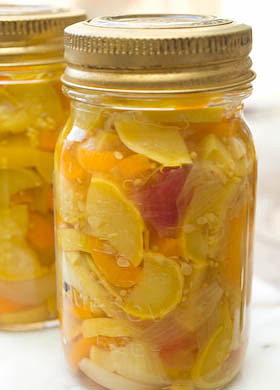 As an ingredient for canning, they are on the acidity cusp. Tomatoes require special attention for bottling safely using the water processing method or else should be pressure canned. They are only just on the acid side of neutral and acidity can vary for different varieties, so it is necessary to add a little more acidity in the form of lemon juice or citric acid to make sure they stay safely putt. It is important that time spent preserving has a very definite pay off later so it makes sense for me to bottle really useful tomato passata-type sauces for cooking up further down the line into pizza toppings, pasta sauces or as additions to winter casseroles. 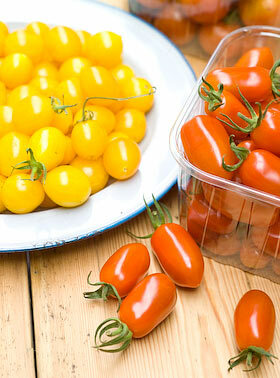 Each year I begin the growing season with high hopes for an extensive range of weird and wonderful tomato varieties. I don’t have a greenhouse so can only grow toms out in the open. We’ve had two consecutive years of blight bringing these plans to a soggy and disappointingly diseased halt, but this year the weather has been kinder. Tinned tomatoes are as cheap as chips, so I don’t think it is really cost effective to bottle tomatoes unless you have your own homegrown supply or you are able to mop up someone elses glut. The plants I have growing in the garden are still some way from the ‘glut’ stage. Thankfully my neighbour Jane has a greenhouse as well as green fingers. She sells her excess garden produce from her garden wall. Last week I picked up four generous punnets of yellow and red tomatoes from the wall and dropped my payment into the honesty box provided. So first a basic tomato sauce. These cherry tomato varieties are as sweet as anything though perhaps not the most ideal kinds for bottling. 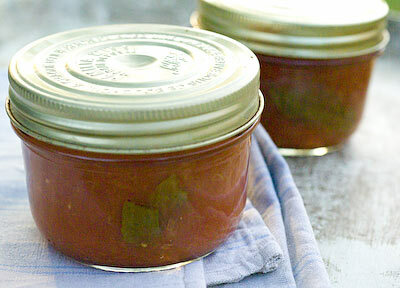 For sauces, larger fleshy varieties like Roma and San Marzano are good. Skinning so many tiny fruits was definitely out of the question for starters. 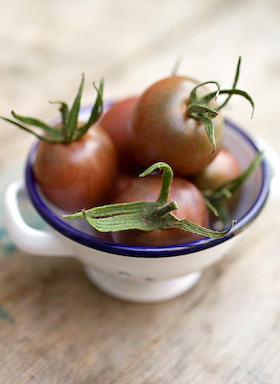 Tomatoes can be very watery, which means that they will require considerable cooking to reduce, thicken and intensify the flavour, unless some of the liquid is removed first. In order to give a fresher flavoured result with less cooking time I began by slitting each fruit and removing the seeds by running my thumb quickly through their middles, collecting the seeds in a sieve placed over a bowl. Any collected juice would come in handy later. After a brief cooking time of 10 minutes the de-seeded tomatoes were then processed using a passata mill, running it through several times to separate the skins from the pulp. The passata mill is a bit of kit I acquired some years ago when dreaming of a bounteous tomato crop that never materialised. 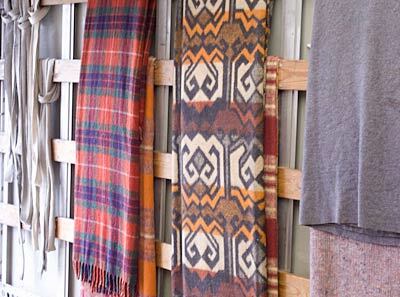 The mill has sat unused in its box ever since so this was its first opportunity to prove its worth. I must say that I wasn’t too impressed. Passata-ing the tomatoes was a messy and annoying business (compounded by trying to take photographs at the same time). Tomato juice splattered all over the place and possibly it was my fault, but juice was squirting out the handle side as well! Next time I will most likely use my regular food mill over a bowl, which though still requiring patience would be less messy and more controllable. Depending on the scale of the project, to remove skins and any stray seeds you could simply push the tomatoes through a sieve if you prefer. Still too watery for my liking, I strained the flesh again briefly in a sieve collecting more juice to add to what had been collected earlier. 2.5Kg (5 1/2lbs) of tomatoes resulted in 775g (1 3/4lbs) puree and 750ml (1.3 pts) of juice. Prepare the water bath, jars and seals ready for bottling (canning). For more info about how to hot water process, refer to the guide here. Put the pureed tomatoes in a pan and simmer for a short time to reach a consistency that suits you so excess juice has evaporated. If the puree is already thick enough simply bring to boiling point. I added 1 tsp sea salt (a non essential, so add salt to own taste or leave out all together) plus an aditional acidic booster. As a general guide you need to add one of the following to every 500ml (1 pt) tomato puree: 1Tbsp lemon juice or 1/4 tsp citric acid. I used balsamic vinegar instead, adding 2 Tbsp balsamic vinegar per 500ml (1pt) puree. 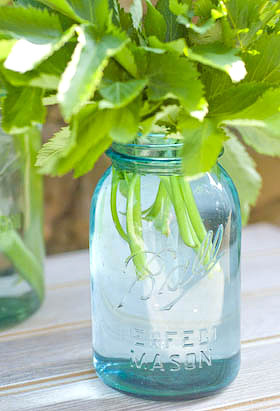 Place a basil leaf inside each jar against the glass and fill jars with tomato, leaving headspace required for your type of jar. 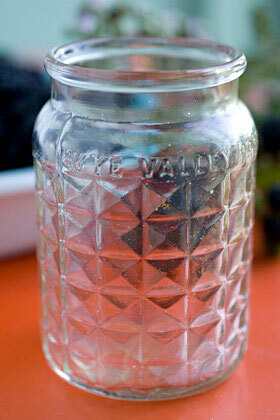 Remove bubbles from sides of jars using a small spatula, wipe rims clean and seal. Process 500ml (1 pt) jars for 35 mins and 1ltr (quart) jars for 45 mins. Remove jars from water bath and leave till cold before testing the seals. 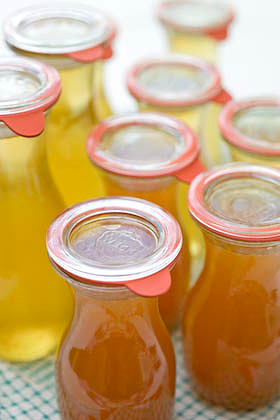 Any jars with loose seals will require reprocessing or you can keep them in the fridge for using up within a few days. 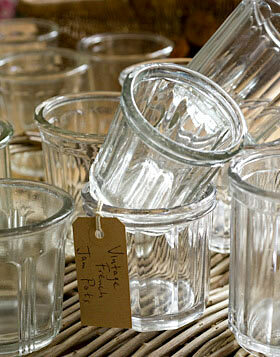 Remember to label all your jars before storing them. My tomatoes made 2 x 350g (12oz) jars of sauce plus a bit more that I had with pasta for my dinner that evening. It seemed a shame to waste the lovely sweet juice collected whilst extracting the tomato puree, so I decided to turn it into tomato jelly. 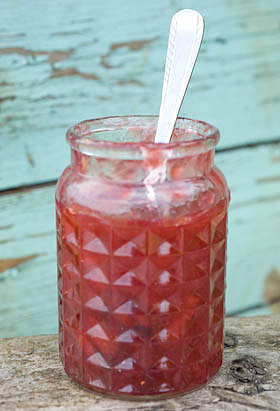 You could flavour tomato jelly with fresh ginger and ground coriander or finely chopped chilli. After much deliberation I eventually chose vanilla and white pepper for a jelly with a sweet / savoury crossover. 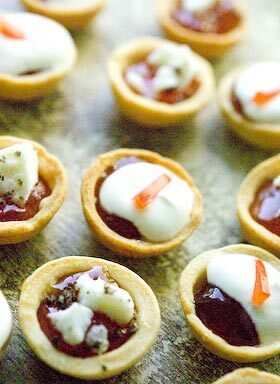 This jelly is delicious on sourdough toast with cream cheese and I used it to fill tiny savoury pastry cases, topped with sour cream or crumbled goats cheese for a really exquisite little mouthful. As tomato juice is lacking in pectin, a boost in the form of the addition of lemon or apple juice is helpful. Having bottled some whitecurrant juice several weeks earlier to use at times like this, I added some of that for its setting quality. Preserving sugar containing added pectin could also be employed here. Adjust proportions to suit what you have available. Pour the juice through a jelly bag, collecting the juice in a measuring jug. To every 600ml (1 pt) juice add 450g (1 lb sugar). Place all the ingredients in a preserving pan. Stir constantly over low heat until the sugar has dissolved then turn the heat up to bring to a rolling boil. Boil to setting point, (it took me about 10 minutes) when a blob of syrup on a cold plate will formed a skin when you push your finger over the top of it. If using a jam thermometer it will register 220F 105C. 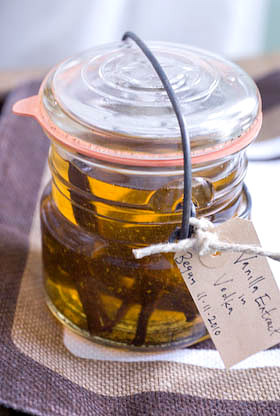 Remove the vanilla pod and fill hot jars, leaving the required headroom for their type. De-bubble the sides using a small spatula or chopstick, wipe jar rims clean, before sealing and placing in the hot water bath. Process for 10 minutes, remove from the bath, then leave till cold before testing the seals. 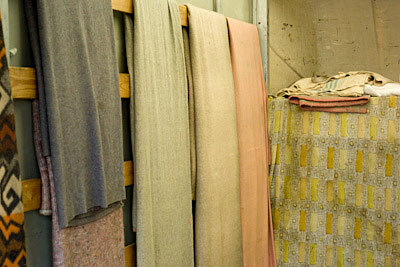 Label and store. 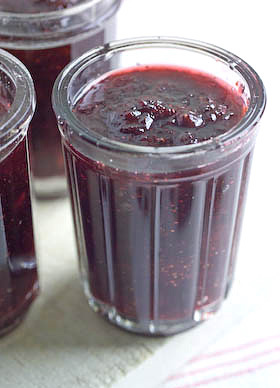 The ratio of sugar to juice is the classic one used when making jellies. 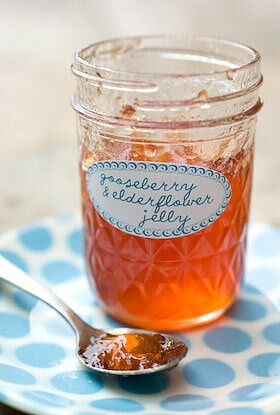 This jelly is very nice indeed but I will be tempted to cut down on the amount of sugar when I make this next. 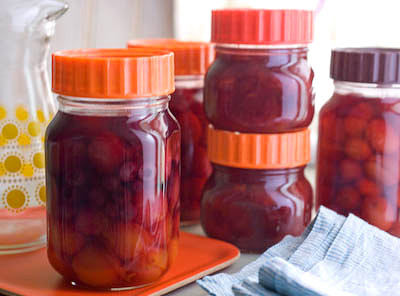 It is often safe to keep jams and jellies without hot water processing (canning) them. 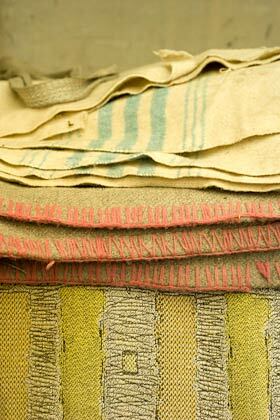 If you do can them you are making doubly certain that they will be preserved safely for a year or even longer. 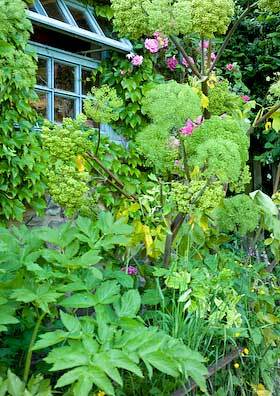 I first came across angelica, the herb, when I looked round my neighbours garden a few years ago. Jane and Les Hales’s garden is very special, so special in fact that it is open to the public a couple of days a year as part of the National Garden Scheme. Jane has planted angelica in several parts of the garden and uses this tall stately plant to form screens against the house. I was instantly impressed by the plants towering stature and amazing flowerheads that look so graphic and beautiful against blue sky. Jane usually has a few seedlings for sale at her open days. Apparently once you manage to get angelica to grow, this biennial seeds itself freely, so restocking the plant is not an issue. I have tried growing it since then. The first two years, our wet summers encouraged the slugs to decimate my young plants, so even my best efforts came to nothing. 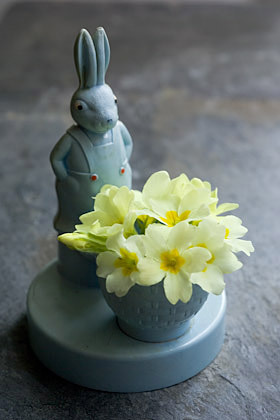 This year is looking slightly brighter, and I already have a plant doing well on my allotment and a few more small seedlings that I am cherishing a little longer before planting them out to fend for themselves. 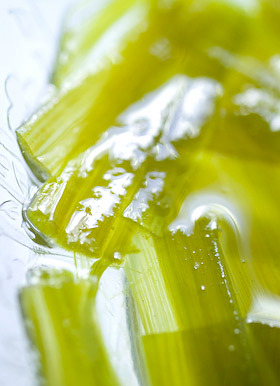 I had a vague recollection of candied angelica from my childhood, a strikingly vibrant green confectionery used to decorate trifles, a small strip pushed into the cream top layer either side of a bright red glace cherry, and can just about recall it having a rather exquisite and unusual flavour, but that was as far as my knowledge went. I certainly had no inkling that it came from a herbal or vegetable source. This of course set me off on a quest to find out more about the culinary merit of this impressive herb and I vowed to have a go at candying my own angelica to try and rediscover the distinctive flavour remembered as a kid. All parts of the plant are aromatic and edible. The stems are the bits you candy to make confectionery, the leaves are used for flavouring many liqueurs such as chartreuse as well as in the preparation of bitters, and with juniper berries to flavour gin, the root is blended with wormwood and other herbs to make absinthe and the seeds impart a muscat-like flavour to wine and are used in the preparation of vermouth. All impressive stuff. 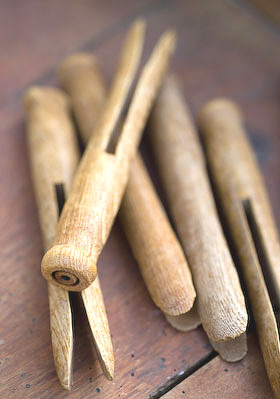 Stems for candying or crystallizing need to be young. 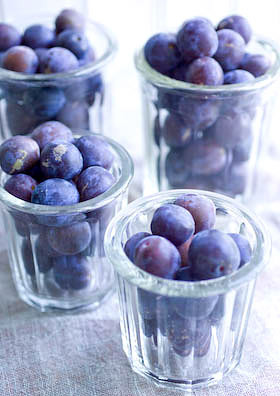 It is no good waiting too long to harvest them as by June – July time they will be far too stringy and tough to work with. You will know by now that being prepared well enough ahead is not my strongest point, but this year, for once, no doubt prompted by Tigress’s can jam canning challenge I am taking part in, which has chosen herbs for our April ingredient, I have gotten round to acquiring a handful of stems and a nice bunch of leaves from Jane which she very kindly cut for me. The plan, to use angelica as my canjam ingredient (post to follow this one), but also to candy some stems at the same time. 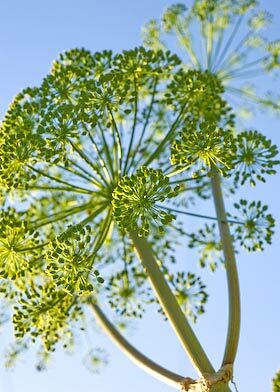 What is interesting is the point at which the angelica turns from a herby savoury scent and flavour to a sweet unctious syrupy one. The stems need first to be boiled and scraped, which is a bit fiddly, before layering them with sugar to begin the transformation. 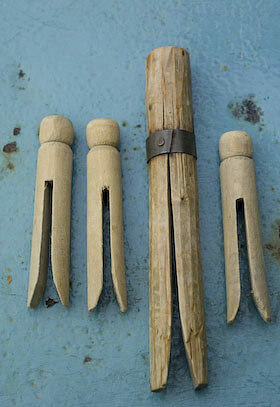 As I had very few stems to play with, I used some of the thicker leaf stalks as well. Apart from the peeling process, it was merely a matter of 5 or 10 minutes of activity followed by a day or so of leaving well alone, so it is hardly taxing. As soon as a syrup started to form, the angelica took on the magical taste I remembered and I felt as though I had captured the essence of this wonderous herb. It is worth having a go, even if you only candy angelica once in your life. The basic recipe I followed comes from Bee Nilson’s Herb Cookery, published in 1974. She is one of my favourite cookery writers for allsorts of reasons. Scale the recipe down if you don’t have enough stems. 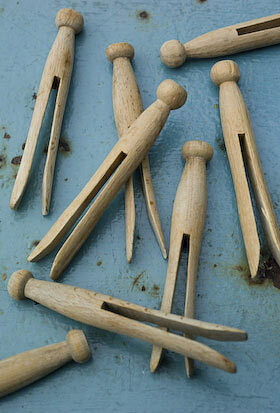 Wash the stems and cut into 8-15cm (3-6in) lengths. Boil them in enough water to cover until the stems are tender. For young stems this should only take about 10 minutes. Drain well, rinse with cold water and drain again. Scrape the outer skin from each piece. I found it easiest to slit down the side of each hollow tub and lay them flat on the surface. The skin comes off really easily but you need a lightness of touch so what remains isn’t damaged. Place them in a shallow dish. Sprinkle the sugar evenly over the stems. Cover the dish and leave it for 2 days by which time the sugar will have dissolved and become syrupy. 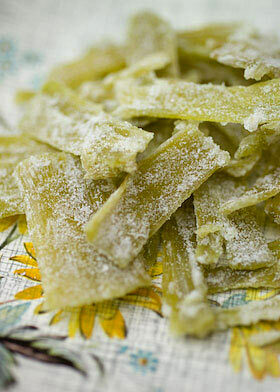 Put the angelica, sugar syrup and water in a pan and heat whilst stirring until the syrup boils. Simmer gently until nearly all the syrup is absorbed and the angelica is clear. Add more water if the syrup has all gone but the stems aren’t looking transparent. 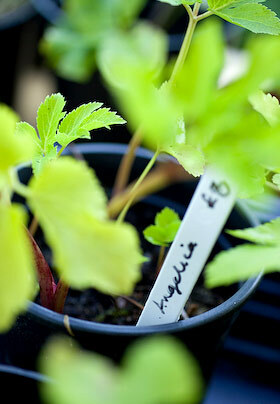 Drain the angelica and leave till cool enough to handle, then roll them in more caster sugar to coat them generously. 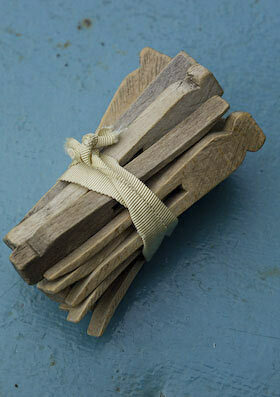 Spread the pieces on a wire cooling rack and finish drying them in a warm place or a very cool oven. 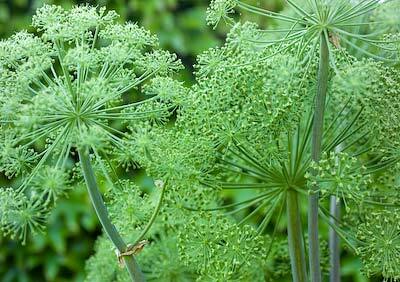 When cold wrap the angelica in waxed paper to store. This year, Ramblers, Jane and Les Hale’s garden at Aylburton Common in the Forest of Dean, is open as part of the National Garden Scheme on two Sundays; 2nd May and 13th June 2-6 pm, and also by special appointment during May and June only. You can find more information on the National Garden Scheme website here. 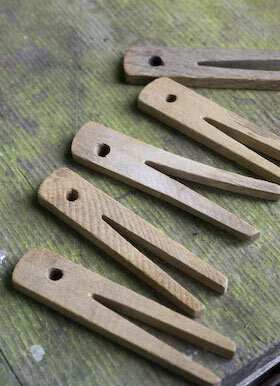 I thought you might like to see these old clothes pegs. With a company called The Laundry it was inevitable that I would acquire some interesting laundry related things over the years. 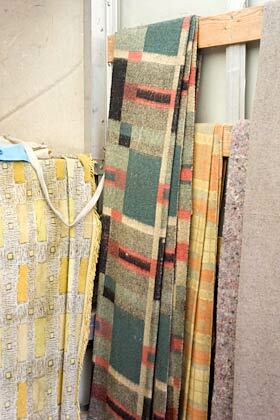 I haven’t set out to collect these things avidly but chancing upon them, I have just picked them up along the way. 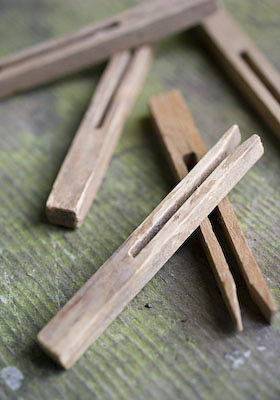 Old wooden clothes pegs have such a lovely hand-crafted look about them and these ones would most certainly have been hewn out of British timbers, hard enough to stand the test of time and repeated use. 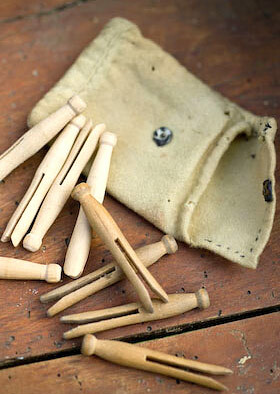 I discovered some of them in an old peg bag found at a car boot sale. 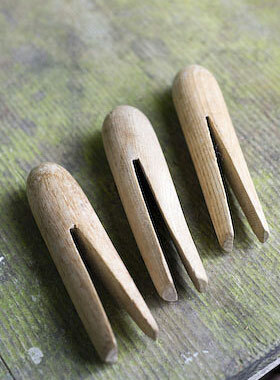 You do sometimes find all different shaped pegs jumbled up together and if you are lucky there might be some special examples in amongst the bog-standard ones. 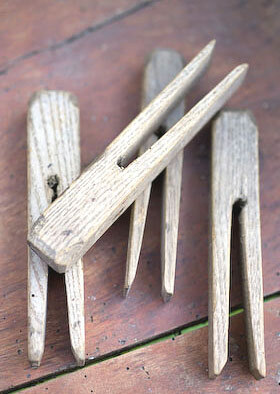 The three big chunky pegs were sold to me as blanket pegs and one of them has a few woodworm holes. I went up north for a few days last week and made sure to visit the car boot sale in Preston whilst I was there. It is the best sort of car boot, in so far as there is always so much total rubbish on sale that it fills you with optimism that a bargain is just waiting to be found in one of the grubby house clearance boxes. I only bought 3 old cookery books but felt that my rummaging time was time well spent. 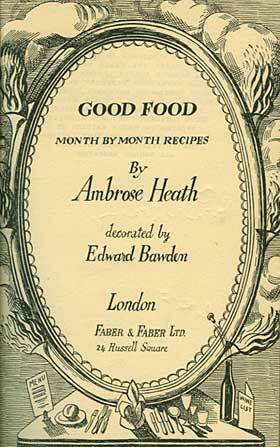 One of the books, Good Food by Ambrose Heath, is an absolute corker. Unfortunately, it long ago lost its dust jacket (which I would love to see) and from the outside it seems quite uninspiring, battered linen, aged and discoloured beige, but inside is such a treat. It is often said that nothing is new and this book clearly proves the point. It is set out month by month with recipes using seasonal produce and rather than the recipes being laid out in the usual manner it has running text with the recipe headings written in the margins. A bit like Nigella Lawson’s How To Eat. I bet you anything that in the editorial meeting when they came up with the format for Nigella’s book they thought they were being groundbreaking. 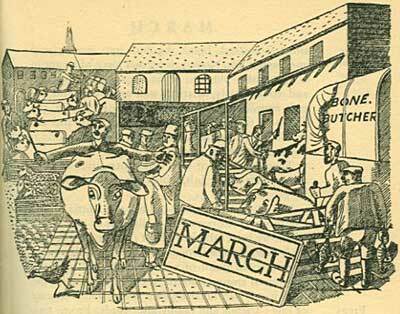 In fact they were pipped to the post by 70 years, Good Food was published in 1932. 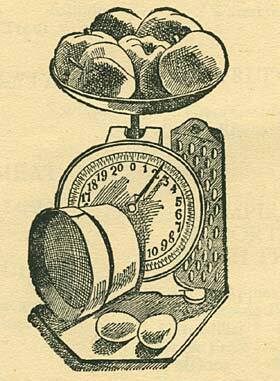 To make the book even more fabulous it is illustrated by Edward Bawden, with an image to represent each month as well as some smaller incidental images of cooking implements and produce. If only it still had its dust jacket, I imagine that would be really special. Of course now I am on Ambrose Heath alert and am looking out for more of his books. Apparently he was a very prolific cookery writer (1891-1969) and wrote around 100 books on just about every food subject and ingredient under the sun. I would particularly like to see ‘Open Sesame – The Way of a Cook With a Can’ published in 1939 (sorry Delia, he beat you too it). Anyway, keen to try out some of his recipes I spotted one for Orange Jumbles, which are a flat sprawling biscuit made with flaked almonds and orange rind and juice. I am getting ahead of myself here as they are in the April chapter but as we can usually find oranges of some kind all-year-round and recipes with funny names are always a good thing then why not?. I decided to experiment and have had to make them a few times to get the recipe right – hard work but somebody had to do it. I have substituted some of my Seville marmalade as an ingredient, missed out cochineal, who on earth uses that these days, and they seem to have worked out pretty well. Ambrose didn’t seem to believe in molly-coddling his readers and the recipes are suitably vague on technique. Of the Orange Jumbles he writes, ‘To say that they are indescribably charming really describes them’. If I wasn’t so busy eating my way through a plate of jumbles I’d say ‘I couldn’t agree more’. 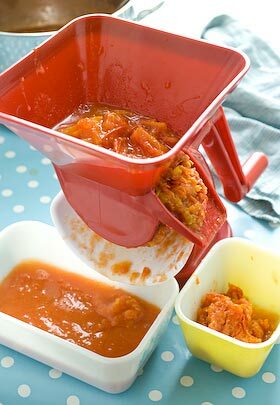 Here’s my recipe for Marmalade Jumbles.